Airport Road Park and Wyomia Tyus Olympic Park are two of the most popular and most used parks in the area. 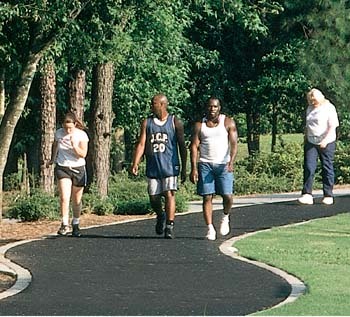 Airport Road Park features a unique 1/2 mile walking trail constructed of approximately 7,000 recycled tires. The park also provides a playground and commons area for people to enjoy nature at its best. Click Here for more information on our parks. The Wyomia Tyus Olympic Park, named for a local resident who was an Olympic Gold Medalist in track, features wooded landscaping with a complex that holds soccer and baseball fields, paved walking trail, a 1/4 mile rubber walking track with a special needs playground, a lake and two picnic pavilions. Three facilities have regulation indoor basketball courts, and there are adult softball fields, weight rooms, playground equipment, restrooms and concession stands at most of the recreational areas. AMBUCS Park anchors Griffin Youth Baseball. It is the site of regular season and year-end tournament play. Volunteer Park is a complex of softball and football fields. The Park at Sixth has a pavilion, which is also available for private event rental, is the home of local concerts and movies under the stars. Dundee Lake Park, located on 184 acres, offers peace and tranquility for the nature lover of all ages, featuring fishing, a picnic shelter and restrooms. Griffin’s City Park, convenient to the downtown shopping/business area, attracts residents and visitors alike as a place to hold picnics, attend ball games or meet for a quick outdoor lunch, it is also popular as a location to take a pleasant stroll on the tree-lined walking trail. During the summer months, the swimming pool at the City Park brings youngsters and adults to play in the water or just soak up the sun. In addition, the park hosts organized leagues and casual pick-up games in the gymnasium as well as on the ball fields, skateboard enthusiasts enjoy the Grind Skate Park, and there are also tennis courts and playgrounds. For the golfers in the area, City Park has a challenging 18-hole golf course; for a family golf outing visit the AMBUCS Miniature 18-hole course. The Griffin Country Club features an 18-hole course, a swimming pool, tennis courts and luxurious dining facilities. Another golf course, Cabin Creek, offers 18 holes on great rolling hills with plenty of challenges. Also nearby there are two Canongate Courses, one at Heron Bay, the other at SunCity Peachtree. The Cedars, The Pines, Raintree and Morgan Dairy are other 18-hole courses in nearby counties. Griffin and Spalding County provide excellent access to outdoor recreation areas. The Flint River is great for fishing and boating along the western border of the county, and local fishermen make their big catches at the City Reservoir or at Still Branch Reservoir in nearby Pike County. For the marksmen who want to hone their skills, Cherokee Rose is a state-of-the-art sporting clays range and a fully automated course with exciting targets for all shooters. “The Rose” is located on 125 acres of towering pines and beautiful and hardwoods offering a shoot-off arena with renovated stands. One is covered for shooting in rain or shine, while the other is located in a well-landscaped shoot-off arena. Both are lighted for evening shooting. For directions, more information and hours of operation, visit www.cherokeerosesporting.com. Several natural outdoor settings with an array of amenities are located within a short driving distance of Griffin. Callaway Gardens, a 14,000-acre world-renowned resort, offers beautiful grounds in Pine Mountain, Georgia. In addition, more than 30 miles of hiking and riding trails can be found at Franklin D. Roosevelt State Park, also in Pine Mountain. Indian Springs State Park, High Falls State Park and Jackson Lake provide opportunities for fishing, camping, swimming and boating. Project S.A.F.E. (Shooting Awareness, Fun and Education) serves over 90 4-H members and teaches firearm safety, proper shooting techniques, good sportsmanship and teamwork. Project S.A.F.E. teams are currently practicing at the Ole Mill Range Complex on the corner of Broadway Street and Searcy Avenue. Our team of coaches teach the youth in the disciplines of BB, Air Rifle, Air Pistol, Rimfire Sporter and Smallbore several nights a week. Visit www.olemillrange.org to learn more.